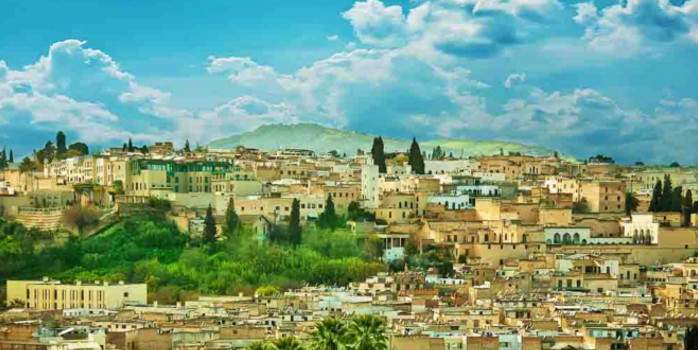 Golf in Fez At the outskirts of the imperial city of Fez, on the road to Ifrane and the Atlas, Royal Fez extends through lush olive groves and open countryside looking out towards the mighty mountain range. Royal Fez Golf Club : A challenge to match the majestic setting Royal Fez Golf Club, Morocco. The course at Royal Fez enjoys a magnificent setting and the architect Cabell B. Robinson has put all his talent and heart into the layout to provide a golfing challenge matching the setting – accentuating the natural contours of the terrain to produce the undulating fairways and the treacherously sloping greens. The course is typically American, with wide open fairways, multiple tee positions, bunkers, giant bunkers and monumental bunkers and, of course, water. There are five lakes creating interesting water hazards, all beautifully blended into the course layout. The Fez medina The Fez medina holds an uncontested place as the most extraordinary medina in Morocco and is designated in its entirety by UNESCO as a world monument. Medersas or Quranic schools back streets of Fez, MoroccoIt is in this old quarter that visitors come across the many Medersas or Quranic schools that are still in use today. These schools bear a legacy to past grandeur as the courtyards are paved in marble or onyx. The most famous of these is the Attarin Medersa, which was built in the early 14th century, and features a beautiful bronze door and an elegant courtyard. The school has numerous examples of excellent detail work, in marble, alabaster and cedar wood. El Qaraouiyin Mosque The one structure that is undoubtedly breathtaking is the El Qaraouiyin Mosque with its magnificent roof of emerald tiles. The mosque has been the centre of Islamic teachings for more than 1,000 years. Founded in 857, it predates Oxford and Sorbonne as a centre for learning, and still retains its status as one of the main intellectual centres of North Africa. 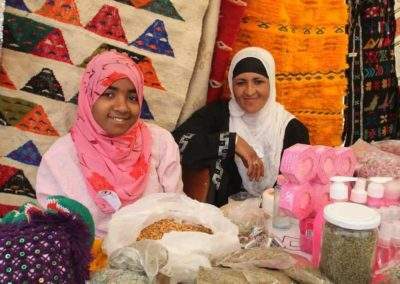 Kissaria – the commercial centre In the Medina, a labyrinth of sloping, winding alleyways are crammed full of stalls and workshops. This is the famed Kissaria – the commercial centre. A multitude of locally produced goods are on sale in this incredible maze. They include cotton fabric, silk, brocadework, and slippers. 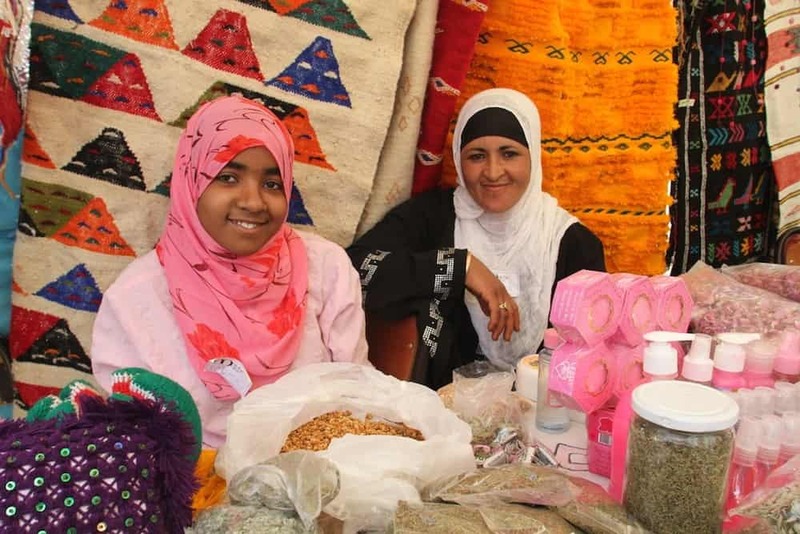 The craftsmen of the El Atterine Souk offer the visitor a non-stop spectacle. For hundreds of years such work bas been regulated by traditional guilds, ensuring that the quality of goods sold there are worthy of the city. 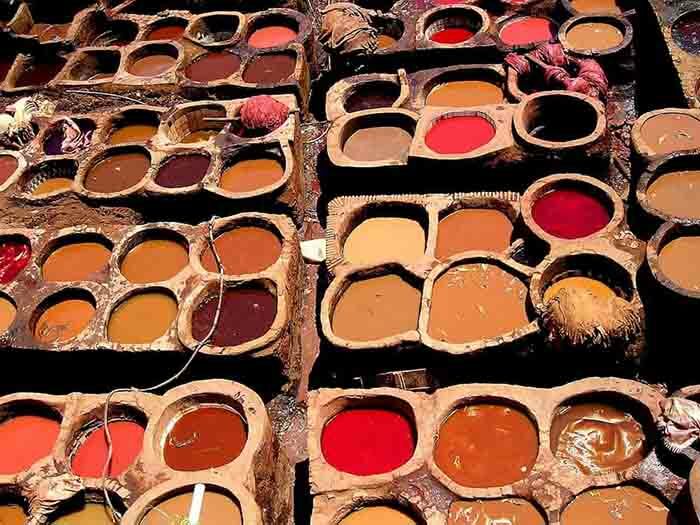 Souq Dabbaghin, or the tanners’ quarter tanners of Fez, MoroccoAnother fascinating facet of this great city is Souq Dabbaghin, or the tanners’ quarter, which is situated no more than 50 metres away from the El Qaraouiyin Mosque. 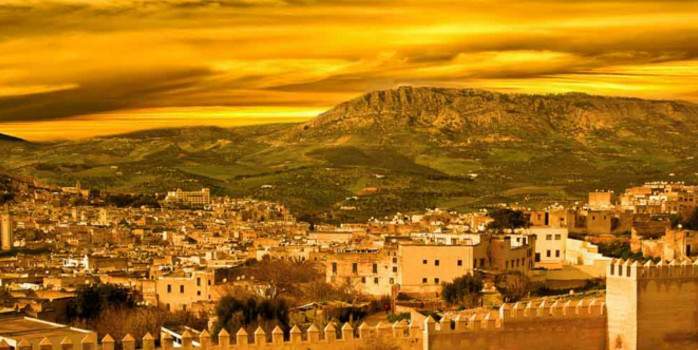 Undoubtedly, the leather handicrafts from Fez are some of the best examples of Moroccan art. 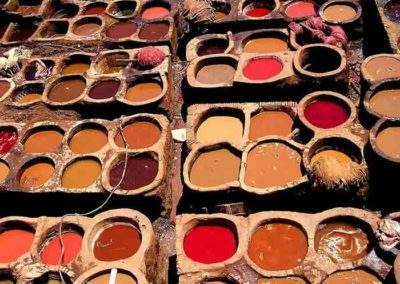 The tanners’ quarter has become one of Fez’s main attractions because from a raised platform, visitors can look down on the whole area, and watch the complete process of leather making, witnessing the contrasts between the brownish honeycombs, the white houses and the intense colours of the dye. Fez el Jedid, or the New Fez It was only around the 13th century when the Merinides came to power that Fez el Jedid, or the New Fez was built. 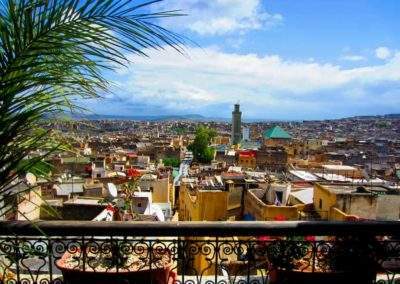 They expanded outside the walls of the Fez el Bali and added gardens, palaces, mosques and souks. Bab Boujeloud The Bab Boujeloud is one the most famed gates in Morocco, being the gate that links the old and new quarters of Fez. Built as late as 1913, the gate is strikingly beautiful and benefits from a wonderful view of imposing minarets from the outside. As visitors enter the gate, the colour of mosaics change – the outside blue reflects the colour of Fez, while the green on the inside is the colour of Islam. 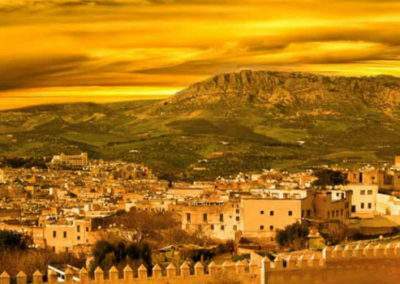 Pastilla Fez is also considered the birthplace of a culinary dish that is considered a delicacy of Morocco. This is the legendary pastilla – a flaky pastry that is stuffed with a blend of minced pigeon, almonds, sugar and spices. Most local restaurant outlets serve the dish, which despite its rather unappetizing sound, is rather tasty, and despite its small size, very filling. 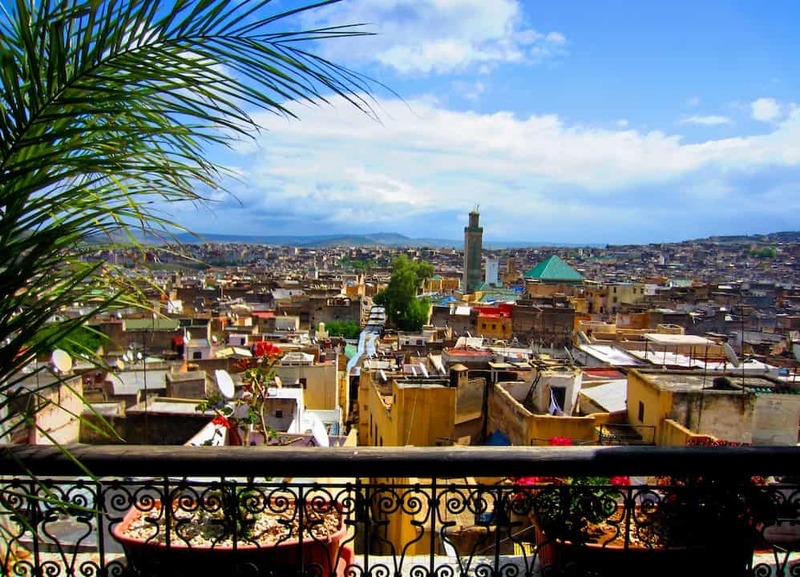 Atlas Mountains and around Fez The areas around Fez are blessed with nature’s bounty and crystal clear lakes, verdant forests and the imposing mountains of the Middle Atlas, bestow sublime beauty to the region. 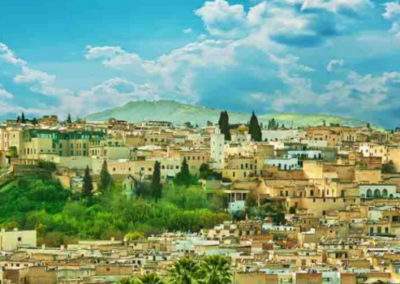 The city is also popular as a base for treks out into the foothills of the Atlas Mountains, and the views over the city from the higher paths are simply breathtaking.